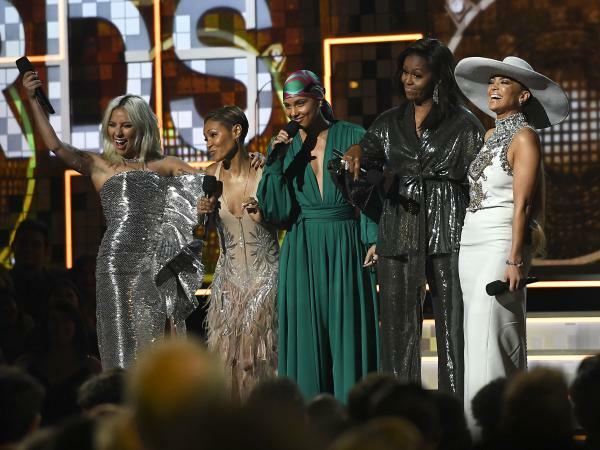 In a pointed moment, host Alicia Keys (center) opened the 61st Grammy Awards by bringing out Lady Gaga (left), Jada Pinkett Smith (second from left), Michelle Obama (second from right) and Jennifer Lopez (right) to speak about women and music. This is NPR Music's live blog of the 2019 Grammy Awards. The telecast of the awards show is scheduled to run from 8:00 until 11:30 p.m. ET. We'll be here the whole time, updating this post with every award or performance. 11:42 p.m. It's beginning to sink in just how shocked America still is by Childish Gambino's "This Is America" — because he's swept three categories, including one of the night's biggest prizes in Record of the Year, in what really is a surprise to me. His producer Ludwig Gorannson accepts on his behalf, saying the song "calls out injustice, celebrates life and reunites us all at the same time." Then, in the spirit of the song, he shouts out the name of one of the many contributors, 21 Savage, who remains under dentention at the hands of ICE since his arrest one week ago in Atlanta. "You should be here tonight," Gorannson says in reference to 21. It's just a reminder that everything at the heart of that song is and remains the state of America. Ariana Grande — who had a public falling out with the night's executive producer, Ken Ehrlich, earlier this week over her choice of song, a year after Lorde was denied the opportunity to perform during the telecast — won best pop vocal album for Sweetener. Kacey Musgraves has won two golden gramophones so far: "Space Cowboy" was voted best country song by the Recording Academy, while "Butterflies" won best country solo performance. She's also nominated for Album of the Year. Lady Gaga — who will be performing tonight without Bradley Cooper, who is in Britain, attending the BAFTAs — won best song written for visual media for, of course, "Shallow" from A Star Is Born. Other cinema winners included Kendrick Lamar, Jay Rock, Future and James Blake for their Black Panther song "King's Dead" (shared with Anderson .Paak and his song "Bubblin"); Hugh Jackman (and various other artists) for The Greatest Showman's compilation soundtrack; and Ludwig Göransson, who composed the score soundtrack for the visual media of Black Panther; and Terence Blanchard won best instrumental composition for "Blut Und Boden (Blood and Soil)," which you may recognize as the main theme to Spike Lee's film BlacKkKKlansman. The Carters' Everything Is Love for best urban contemporary album (shockingly, they weren't present to accept their statue). Chris Cornell's children accepted an award on his behalf, for best rock performance of "When Bad Does Good." Unsurprisingly and well-deservedly, Childish Gambino was given best music video for "This Is America." Laurie Anderson and Kronos Quartet won best chamber music/small ensemble performance for Landfall — read our coverage here. Former Tiny Desk Contest winner Fantastic Negrito's Please Don't Be Dead won best contemporary blues album. The Soweto Gospel Choir, who've visited the Tiny Desk before, won best world music album for Freedom. Widely panned up-and-coming retro-rock group Greta Van Fleet took best rock album. St. Vincent won best rock song for "Masseduction," with producer Jack Antonoff by her side. Matt Pike from the fairly underground metal band High On Fire, who likely didn't ever expect to be ascending to the stage during the Grammys, accepted an award for best metal performance behind Electric Messiah. The night is, mostly, all about the performances. There will be awkward moments, but a planned tribute to Aretha Franklin, which will be performed by Yolanda Adams, Fantasia and Andra Day, had better be one to remember. What will the final speech from Neil Portnow — who caused more than a little consternation last year when he said women needed to "step up" in order to secure broader inclusion — contain? The executive is resigning as president of the Recording Academy this year. Whether the Recording Academy's task force — set up in the wake of Portnow's comments and a severely lopsided number of female winners last year — has been successful in its aims to broaden not only the Academy's membership but also those it honors.